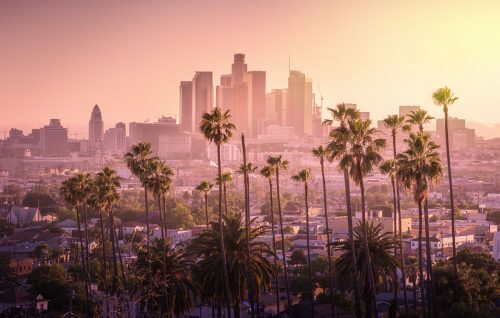 Visitors to California often begin their journey in Los Angeles. 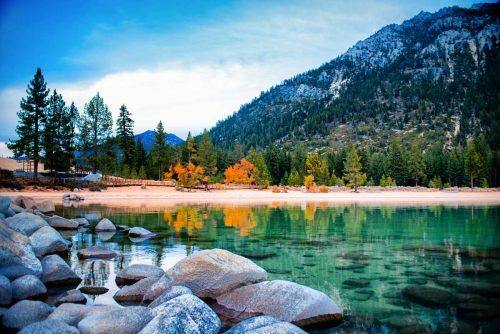 With Lake Tahoe being one of the most popular destinations in the state, I thought I’d share from my experience and suggest a few routes to travel from Los Angeles to Lake Tahoe. 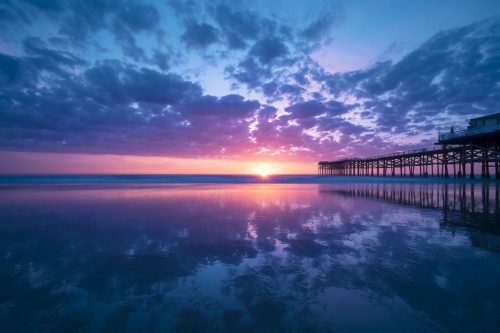 Each of these routes makes a fantastic road trip and if you can, you should dedicate 2-3 days to really get to know the area you’re driving through. 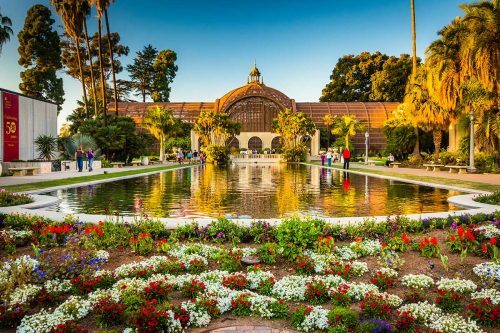 We’ve traveled extensively in California, including along these routes. While we haven’t seen everything yet (the list is long as you’ll see! ), we’ve seen quite a lot of the suggested stops along the way. And yes, we definitely intend to come back and check the others off our own Bucket List too! Before I detail the specifics of each route, let’s cover the basics. As you can see, there’s a mountain range you get across. These are the fantastic Sierra Mountains, of which Lake Tahoe is part of. There are only so many ways to get across the mountains. 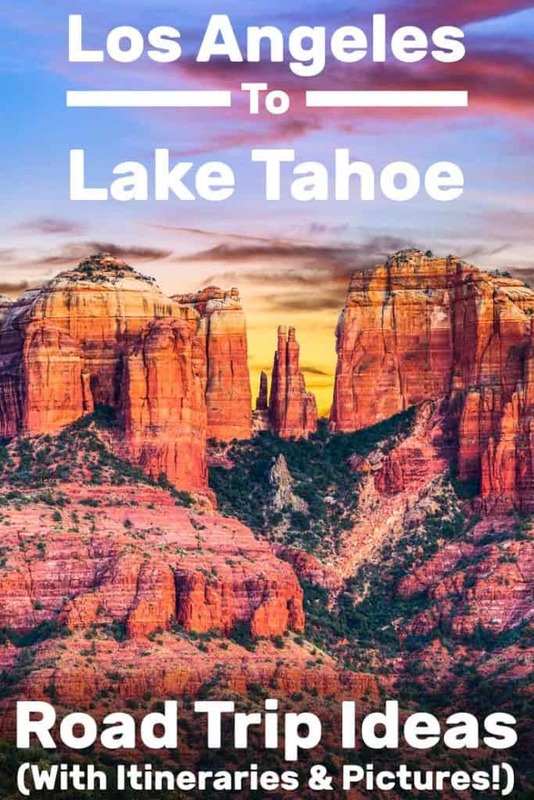 The chief roads connecting California with the eastern areas of the United States are the i-10, i-15, and i-40, going south of the mountains, and the i-80 which goes through the Lake Tahoe Area in a beautiful mountain pass. There are other a couple of other mountain passes crossing the range but they are closed during winter. Mountain Passes are scenic and we love crossing them. Just keep in mind that other than the i-80, mountain roads mentioned in this post will be closed during wintertime. If you’re traveling anytime between November and June, check road conditions before heading out on your road trip. Also, this being California, check road conditions for fires and smoke during summer, spring and fall. Now that you have a general idea of what the area looks like, let’s go over the possible routes. This route is about 450 miles and about 7.5 hours of drive time, according to Google Maps. 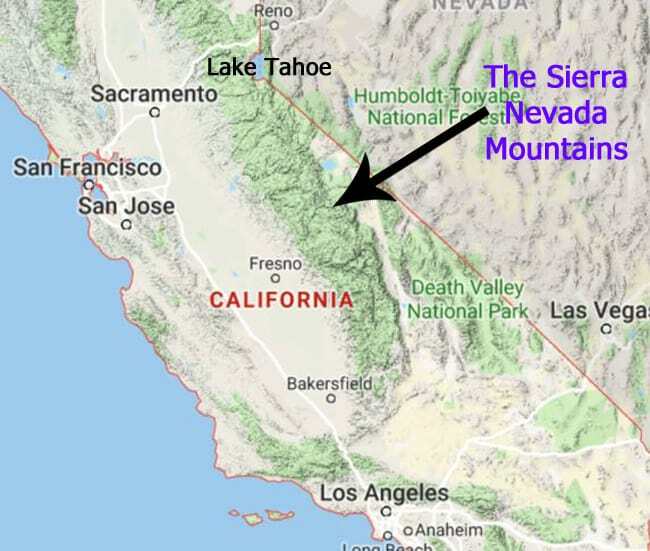 You will pass through eastern California, closer to the Nevada border for most of the trip. To break up your drive, here are some recommended stops along the way that won’t take you too far off your path. About 120 miles northeast of the L.A. area, this state park is famous for its gorgeous rock formations made of layers of different colored minerals. The day use area of the park is open from sunrise to sunset, with (no-hookup) camping available for RVs up to 30 feet long. Entry fees are $6 per vehicle for day use and $25 per night for camping ($23 for seniors). 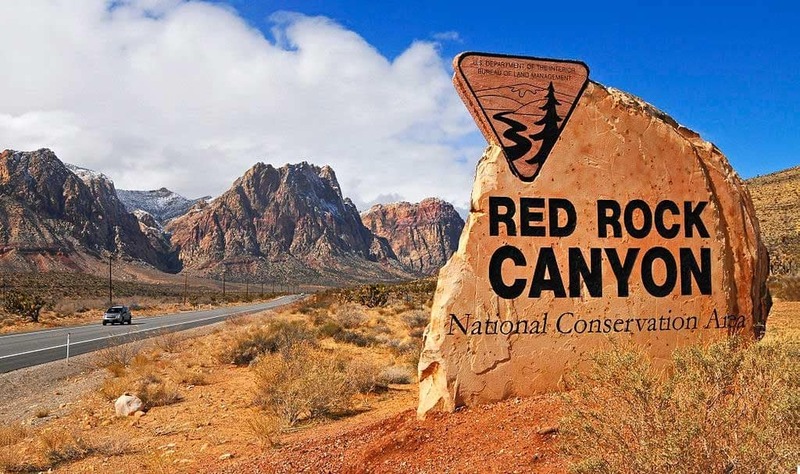 For directions and more, visit the Red Rock Canyon State Park website. 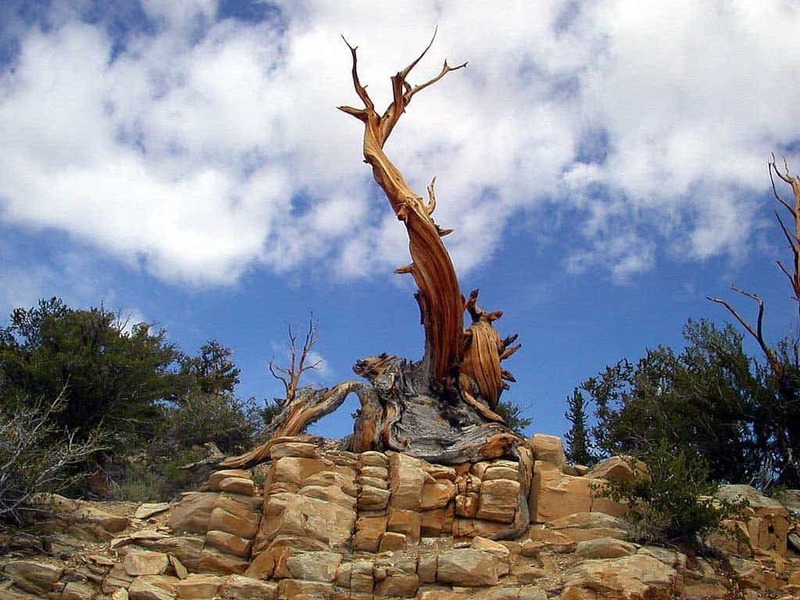 When they say ancient, they aren’t kidding–some of these trees are over 4,000 years old, and this is where you’ll find the world’s largest bristlecone pine tree (called the Patriarch Tree). The park is open for day use only, and winter weather causes road closures; refer to the website for more information. It’s $3 per person to enter, or a maximum of $6 per vehicle. See the website for Visitor Center Hours. 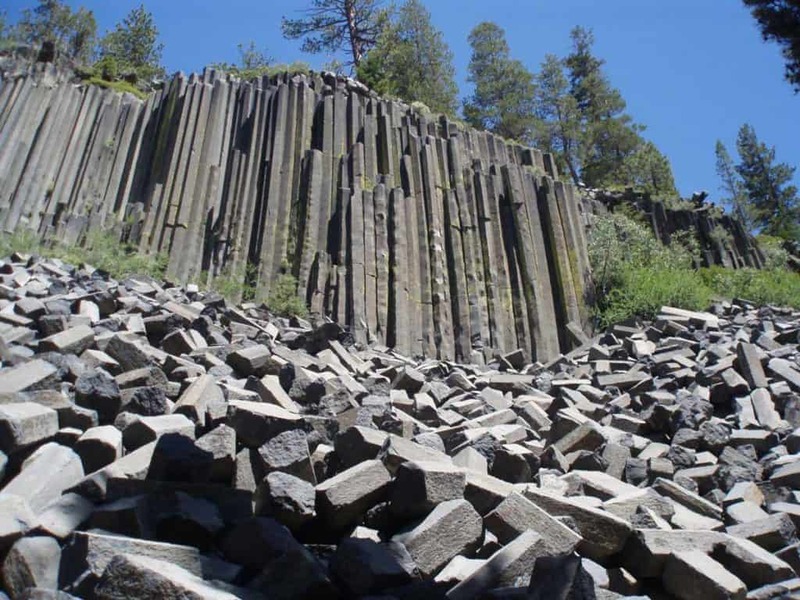 These striking, amazingly symmetrical natural columns are the result of lava flows from about 100,000 years ago. They currently stand about 60 feet tall, with their bases in the San Joaquin River. 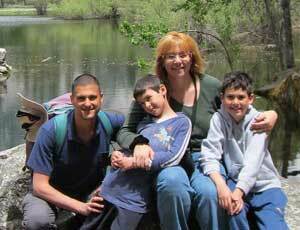 It’s a lovely family hike that we really enjoyed. Visit the website for permit and transportation information. Just keep in mind that the area of Mammoth Lakes is a ski area, i.e. cold during winter! It’s still a great area for a stop, any time of the year. There are tons of wonderful hiking trails around Mammoth Lakes, plus, you’re a stone throw away from Tioga Pass, in Yosemite National Park. If you have the time, I’d stop here for 1-2 days to hike the area. This saltwater lake dating back to prehistoric times is located conveniently close to Highway 395 and covers over 70 square miles. Its unique ecosystem supports the millions of birds who flock to it daily. The best time to go is on the weekend to get a free naturalist tour, or before noon if you wish to take a boat on the lake; note that to protect birds during nesting season, some of the lake’s islands are not accessible; fees are dependent upon which part of the lake you visit. 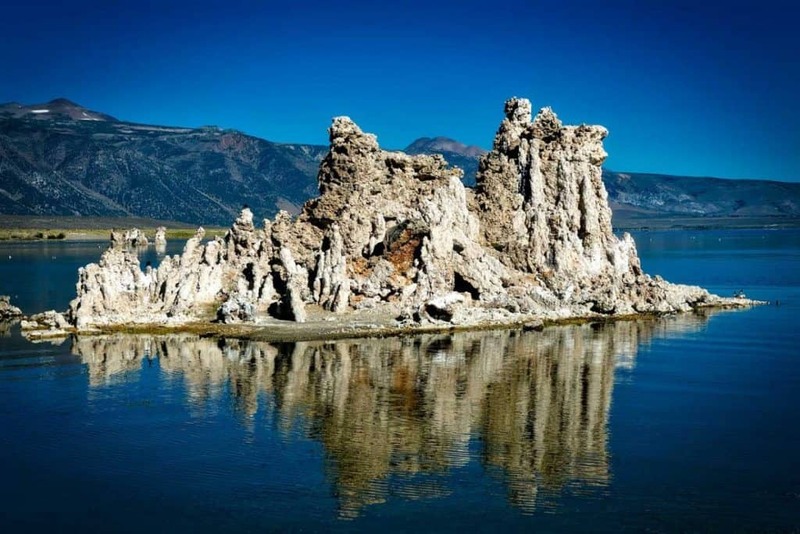 Check out the Mono Lake website for more details. Topaz Lake is only about 50 miles from Lake Tahoe. 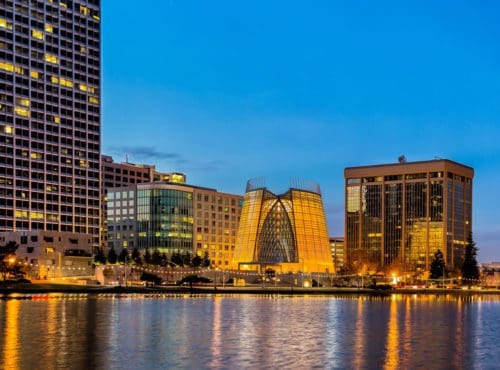 It boasts over 25 miles of shoreline and a lakeside casino with lodging. Camping for tents and RVs is also available through the county park; there is also a day use fee and boat launching fee (fees vary). The park is open year-round. 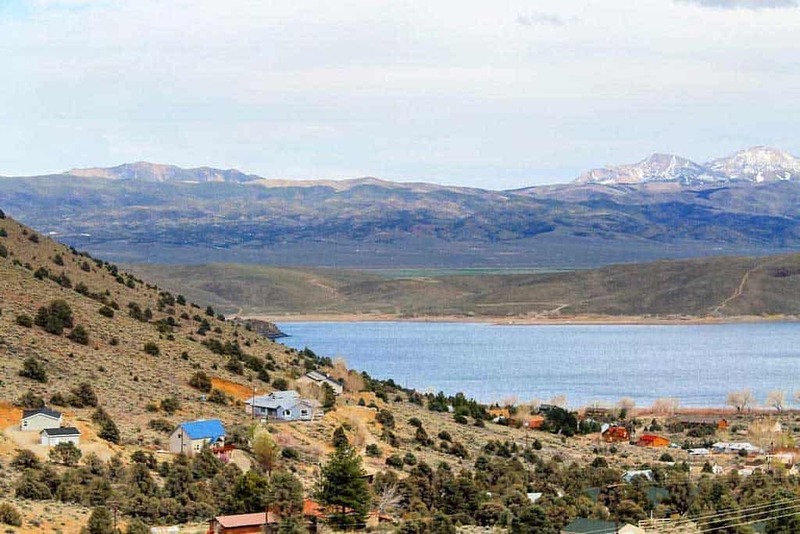 Get more info from the Topaz Lake Recreation Area site. This route takes you over the Sierra Nevadas to visit a spot that is on many people’s bucket lists: Yosemite National Park. Because you will traverse a mountain pass that may be closed during the winter, this trip is best taken during late spring through late summer. It is less than 550 miles with nearly 12 hours of drive time but will take you through some very scenic areas. The Chaffee Zoo in Fresno is a great place to stop if you want to better educate yourself or your kids about animals, and see them close-up (and even feed some of them!). We had a great time there, and you can learn more about the zoo from my post, 11 Fantastic Reasons to Visit Fresno Chaffee Zoo. 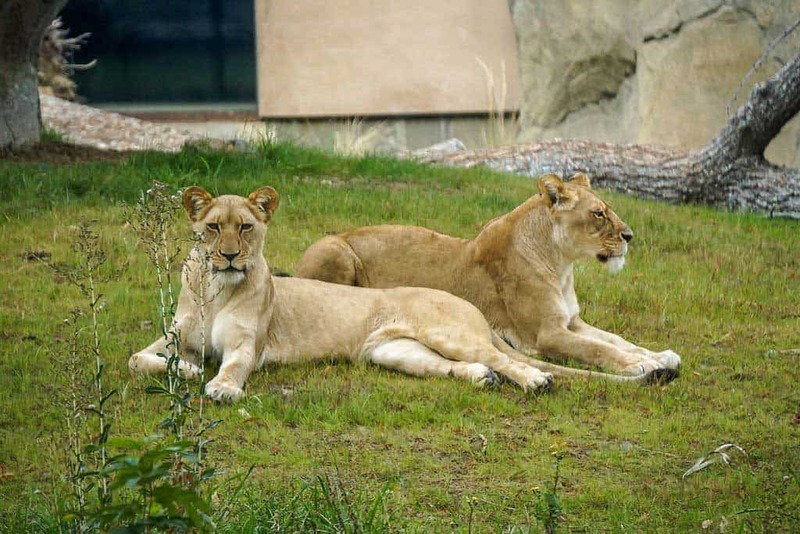 The zoo is open daily from 9 am to 4 pm and admission is $7.95 to $12.95 per person. See the Chafee Zoo website for more details about their newest exhibits. If you’ve never been to Yosemite, this is a Bucket List destination. 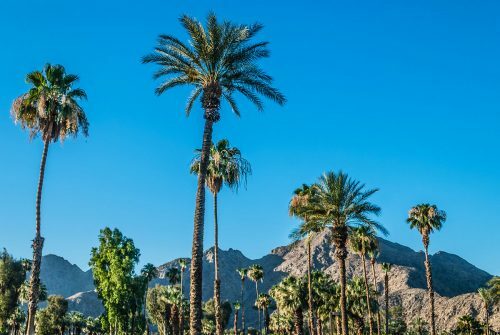 Definitely the best place on this list to stop for 2-3 days, especially if you happen to be traveling during late April till June when the waterfalls are roaring the park is out-of-this-world gorgeous. 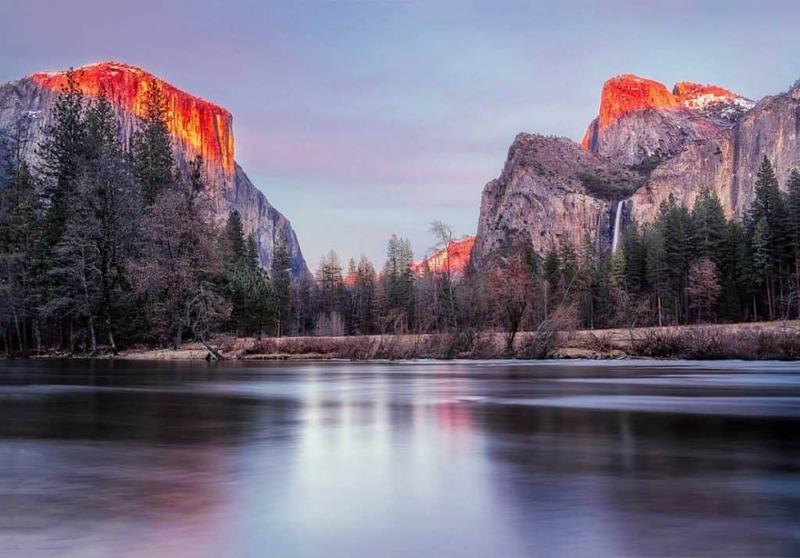 Visit the National Park Service website for updates about Yosemite National Park. Yosemite National Park is open for limited use during the winter; Yosemite Valley is open, although you will likely need snow chains to reach it. Visitors during the winter express it’s “like being inside a snow globe” and “a winter wonderland” while summer visitors call it “majestic” and marvel at the tallest waterfall in North America. Park fees vary, and some entrances are only open seasonally. 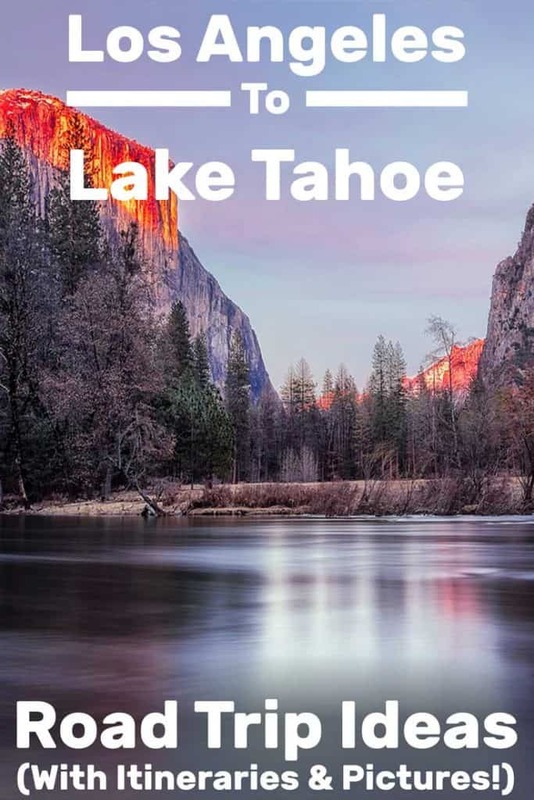 After visiting Yosemite Valley, continue east through the park along Tioga Road/Highway 120 for some gorgeous views of the park and mountains. Even during the summer, at this elevation, it may still be cold, and there could be snow on the ground, so be prepared with warm clothing and appropriate shoes if you want to step outside. The pass (and most of Highway 120) is often closed during the winter due to snow. See the website for Tioga Road opening and closure information. See information from Route #1. This route also includes roads that may experience closures during the winter time. It leads you through interesting historical places in California. The total trip is about 465 miles and approximately 9.5 hours of driving. 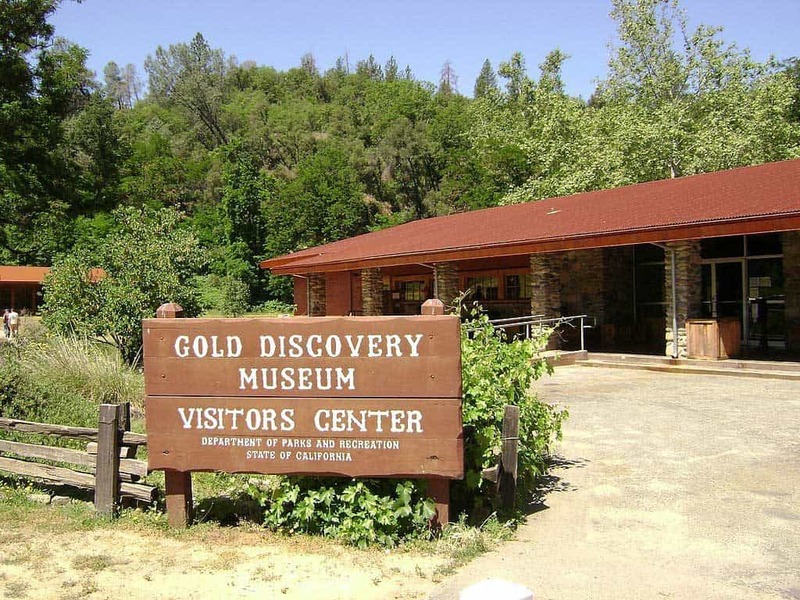 This historic location was first populated during the California Gold Rush in 1848. The area has many historical businesses, including the National Hotel & Restaurant (established in 1859). You can also visit Railtown 1897, a rail park that offers seasonal rides on their steam train. Visit the Historic Jamestown Visitor Guide for more places to see in Jamestown. A short drive from Jamestown is Sonora, CA. Downtown Sonora is a mixture of historical buildings and newer shops and boutiques. 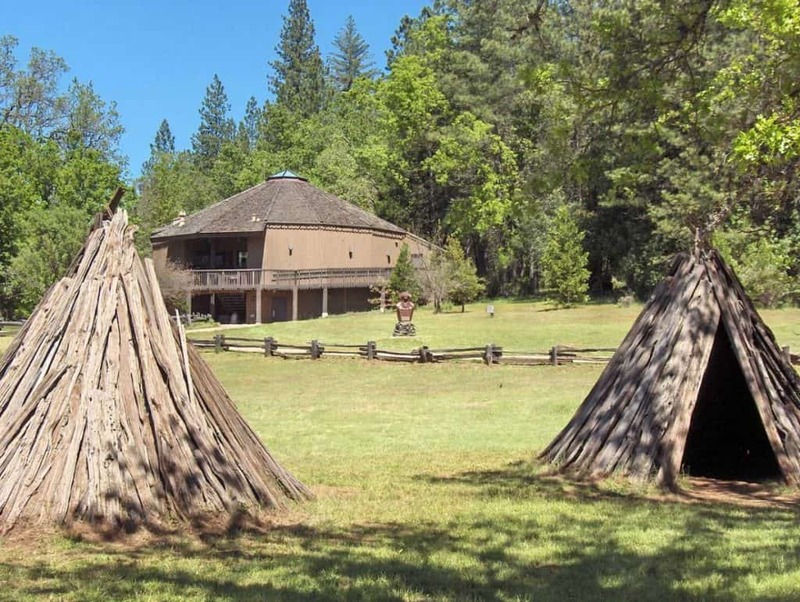 You can also check out the Locomotive Exhibit, Prospector Park Mining Exhibit, and the Tuolumne County Museum & History Center, located inside a jail from the 1850s. This website has interactive maps with more information about places to visit in Sonora. 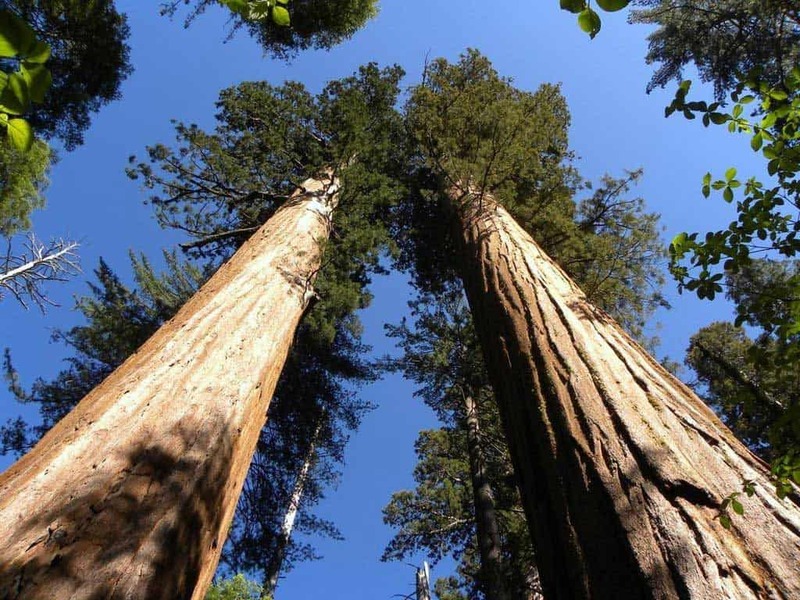 This park is home to a grove of giant sequoias. Also within the park are hiking trails, a river, a creek, a bookstore/gift shop, museum, two seasonal campgrounds (for RVs up to 30 feet long), and four rental cabins. The park is open year-round for day use, sunrise to sunset; the entrance fee for day use is $10 per vehicle ($9 for seniors). Visit the park website for more information about camping, fees, and other activities. This byway is 61 miles long from Arnold, CA, it begins as State Route 4 and continues on State Route 89 through Markleeville, CA. Along the way, you can visit historic sites, hot springs, lakes, waterfalls, and more. The peak (Ebbetts Pass) is at 8700 feet, so there are often winter road closures due to snow. Get more info about this scenic pass and its history here. This route is similar to #3A above but uses roads that are usually open year-round. 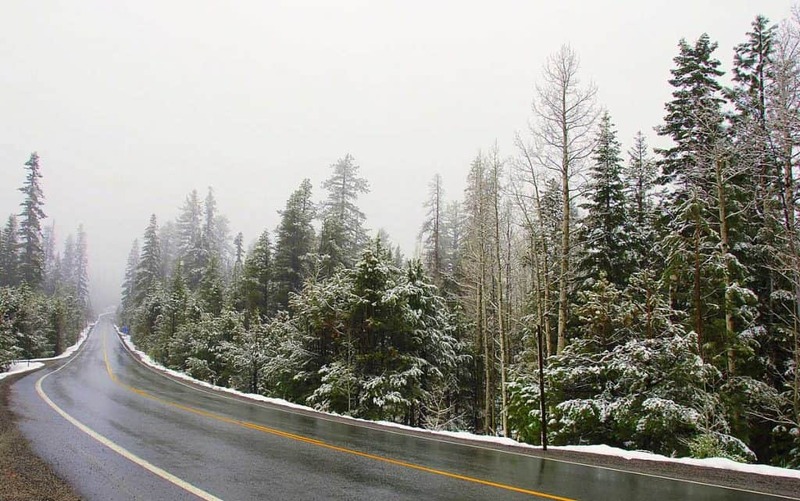 After Sonora, you will continue along CA-49, bypassing the snow along SR-4 and SR-89. The trip is about the same mileage as #3A, but shorter drive time. 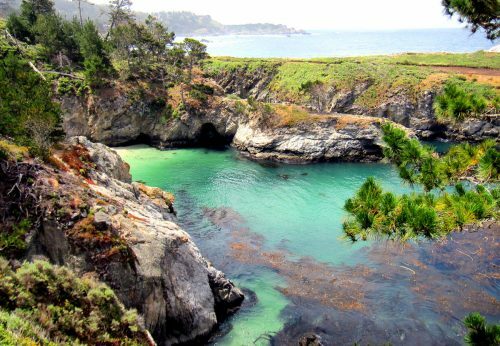 Beautiful Grinding Rock State Park is aptly named because it is the former site of a Miwok village, where its inhabitants would grind acorns for food against the flat, smooth rocks. The park contains a reconstructed village, a marbleized limestone preserve, camping, trails, and primitive camping in bark houses (tipis made of bark). The museum is open daily from 10-4; the day use entrance fee is $8 per vehicle, and camping is $30-$35 per night for RVs up to 27 feet long. Get more info at the park website. From the state park, you’re already right next to Carson Pass Highway, also known as CA-88. 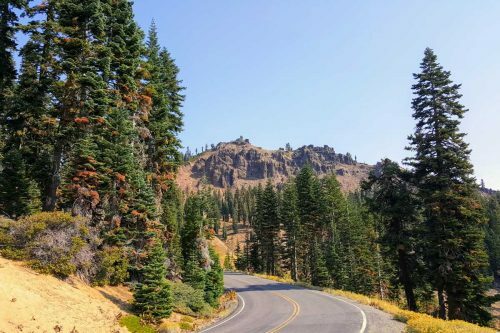 You can travel the entire highway on the way to Lake Tahoe, which is about 58 miles, and the route is rarely closed (although snow chains may be needed). Along the way are opportunities camping, snow sports, water sports, hiking, biking and even cave exploring. 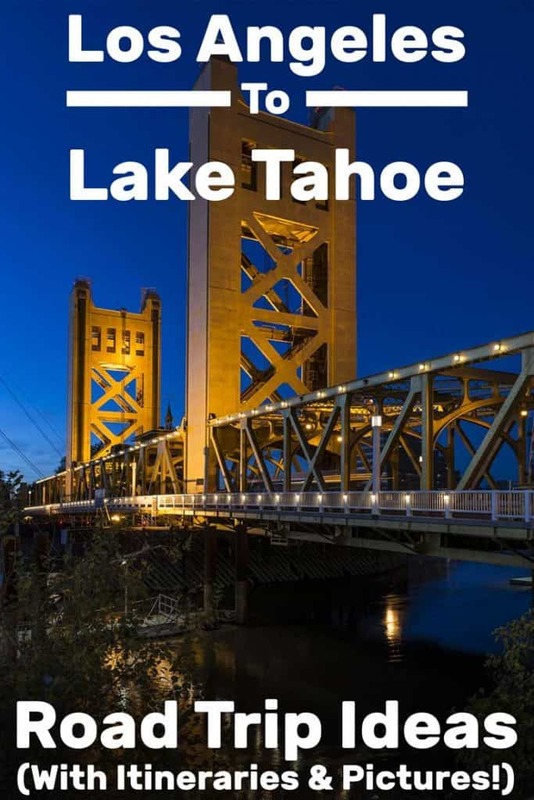 If you want to get to Lake Tahoe as quickly as possible from Los Angeles, the quickest way is to hop on I-5 and take it to Sacramento, then head east. This route is about 500 miles with 8.5 hours of driving, according to Google Maps. 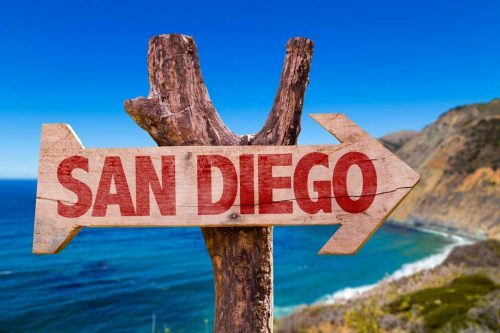 But the speed limit along much of the 5 is 70 miles per hour, which cuts it down considerably compared to some of the smaller (but more scenic) highways along the other routes. For the first part of the drive, be prepared with lots of snacks and good tunes to keep you going because between Grapevine and Stockton, there isn’t much to see (unless you like hundreds of miles of farmland with rolling hills). 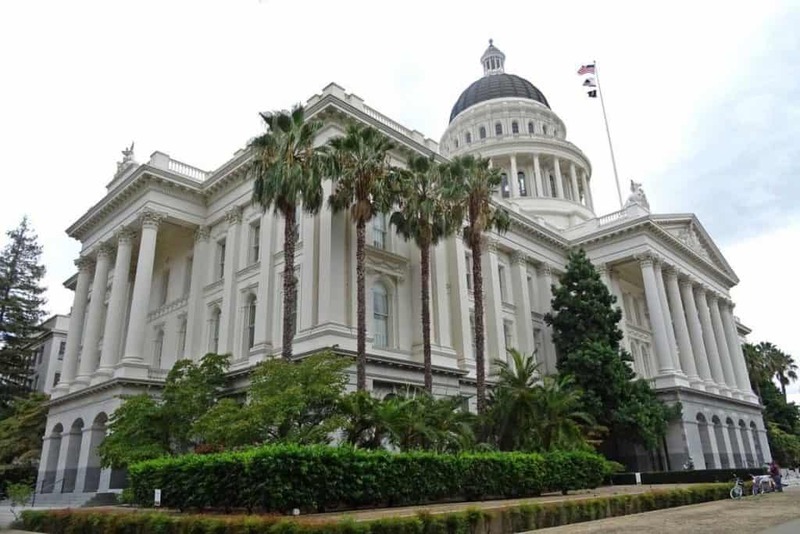 California’s state capital has something for everyone, whether you prefer indoor or outdoor activities, history or sports. 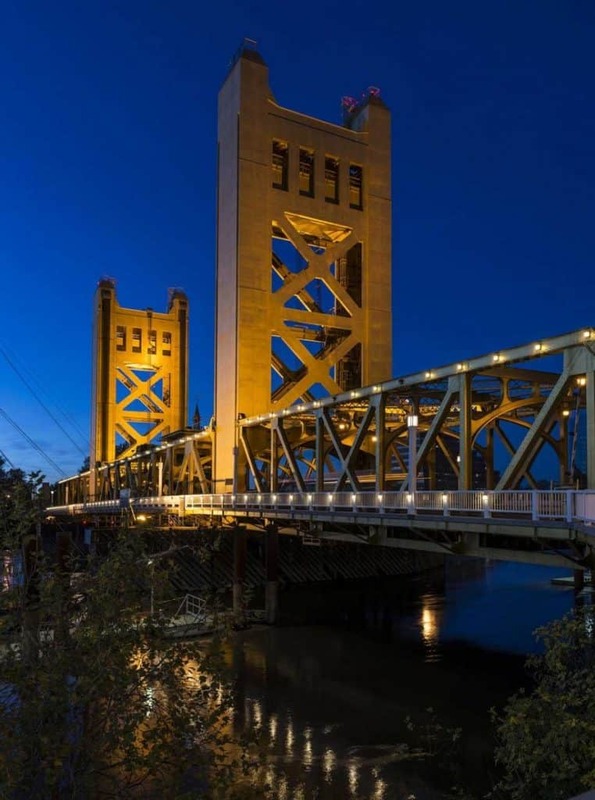 The Old Sacramento Historical District is a must-see, and while you’re there, you can visit the Railroad Museum, take a horse and buggy ride, or walk along the Sacramento River. 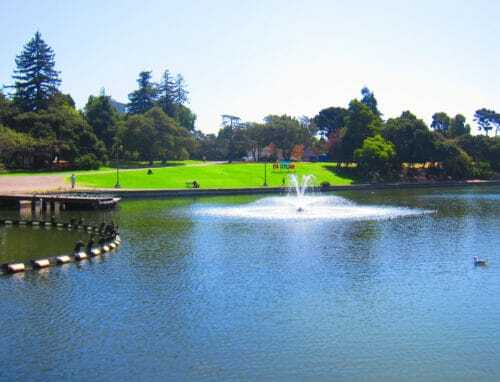 Biking, boating, visiting the state Capitol, Sutter’s Fort, and choosing from hundreds of restaurants are all possibilities as well. Visit the city of Sacramento’s website. About an hour outside of Sacramento, you can visit the state park named after the man credited with discovering gold in this area in 1848. The park has guided tours (for an additional fee) and includes historical buildings dating back to that era. Hours vary by season, and the entrance fee is $8 per vehicle with a $1 discount for seniors. View the Marshall Gold Discovery State Park website. 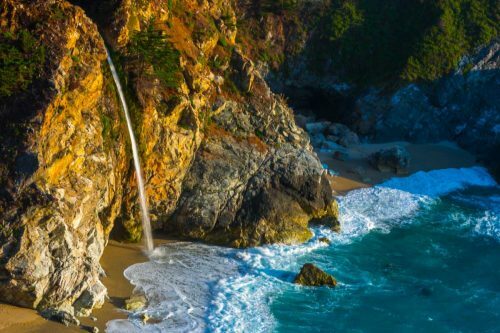 You don’t even have to stop to see this waterfall on your route along Highway 50, but it is worth it to get a closer look and stretch your legs. The water may be frozen in the winter, which only makes it more interesting. There is a large pullout/parking area directly in front of the falls next to the Highway. This park is on the California side in South Lake Tahoe. It is primarily undeveloped, but Upper Truckee River runs next to it; picnicking and hiking are available. Washoe Meadows is a peaceful, scenic place to stop for a bite to eat or a walk before reaching the lake. It is virtually unknown and unused except by locals, and there is no entrance fee. Visit the park info page. What kind of gear should I bring on this trip? No matter which route you take, you will be crossing over mountains. Even if the roads are open all year, many of them retain snow at the higher elevations, even during the summer. You will want to have warm clothes with you for any stops you make in the mountain areas, regardless of the time of year. Also, bring along snow chains if you have them, just in case. I also recommend mountain bikes, swimsuits, fishing gear, hiking boots, snowshoes, etc., depending on your tastes and the time of year. Sunscreen is a good idea as well, even during the winter. If you’ll be walking a lot in the parks, bring along bottled water or hydration packs, as well as snacks. Not all the routes have continuous cell phone service, so be prepared with offline directions. Check the weather forecast regularly, and be prepared to alter your travel if necessary. I hope you find these suggestions helpful. Please leave a comment letting me know if you decide to take one of these routes, and how you liked it!